Freedom Stocks – On the occasion of 70th Independence Day 15th Aug, 2016, CNBC Awaaz has suggested Top 15 Freedom Stocks of 2017. Investment in these stocks can make you financially free in future. You can surely generate a good return by investing in these stocks. Stock market experts like Mr. Gaurang Shah (Geojit BNP Paribas), Sanjeev Bhasin (India Infoline) and Sandeep Jain (Trade Swift Broking) has given a recommendation about these stocks. These stock market analysts also give justification that why these stocks will give good returns in next one year. As per them, you can invest in these stocks and stay tension free for 1 year. So, let’s check out Top 15 Freedom Stocks of 2017 by CNBC Awaaz. 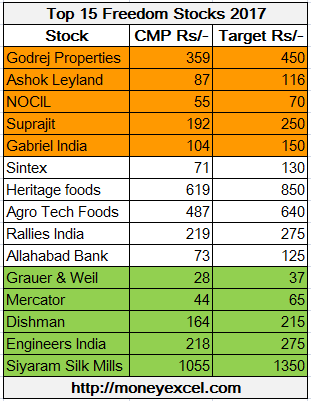 Godrej Properties – Godrej Properties is first freedom stock of 2017. It is expected that real estate sector will be doing very good in next year. Strong order inflow and viable execution are plus points about this stock. This stock can be purchased with a target price of Rs.450 for one year. Ashok Leyland – The second freedom stock of 2017 is Ashok Leyland. A change in defense and transport and GST will surely help this stock. Last quarter result is also good. This stock is recommended with a target price of Rs.116. NOCIL – NOCIL is one of the largest rubber and chemical manufacturer of India. Last three years financial performance of this stock is very good. You can purchase this stock with target price of Rs.70. Suprajit Engineering – Suprajit Engineering is one of the largest cable manufacturers in the automotive space. Suprajit Engineering has a large customer base in automotive space. This stock is recommended with a target price of Rs.250. Gabriel India – Gabriel India is a supplier of automotive parts. Gabriel India is zero debt company. A downside risk in Gabriel India is very low. You can purchase Gabriel India with a target price of Rs.150. Sintex India – Sintex India is next freedom stock. Sintex India is one of the biggest beneficiaries of Swacch Bharat Abhiyan. This company deals with plastic products. The target set of Sintex India is Rs.130. Heritage foods – Heritage Food is a south India based company. Heritage food is dealing in multiple fields such as dairy, retail, agriculture, bakery, renewable energy etc. It is high volume company recommend for investment with a target price of Rs.850. Agro Tech Foods – Agro Tech Food is next freedom stock for 2017. Agro Tech food deals in multiple food products and oil. Mr.Gaurang Shah is bullish on this stock and advising to invest in Agro Tech with a target price of Rs.640. Rallies India – Rallies India is tata group promoted company dealing in agrichemical and pesticides. This stock has 70% market share in pesticide segment. A strong market presence, good monsoon and management of tata group is plus point of this stock. Allahabad Bank – Allahabad Bank is freedom stock recommended for one year. This stock is recommended with a target price of Rs.125. Grauer & Weil – Grauer & Weil is manufacturer and supplier of Electroplating Products, Allied Chemicals, and Industrial Lubricants. A profit margin of this stock is growing every year. You can invest in this mid cap stock with target price of Rs.37. Mercator – Mercator is next freedom stock for 2017. Mercator deals in oil, coal, commodity transport and dredging. This stock is recommended with a target of Rs.65. Dishman – Dishman Pharma is very good stock for the investment.Dishman Pharma has very good product in pipeline. It is a recommended stock with target price of Rs.215. Engineers India – Engineers India provide engineering consultancy & EPC services to clients across the globe. HP, BP, IOCL are under expansion and they will seek consultancy from Engineers India. Order book of this company is very good. This stock is recommended with a target of Rs.275. Siyaram Silk Mills – Siyaram Silk Mills is a textile group of company. It is a recommended freedom stock for 2017. The target set of Siyaram Silk Mills is Rs.1350. Do you think these Top 15 freedom stocks of 2017 will give a better return in future? Do share your thoughts in the comment section. Happy Independence Day to all the readers! « What are Chit Funds? How do Chit Funds Work?